We (meaning me) here at Apple Briefs have been quite busy with the “day job” lately and haven’t had much time to post. I don’t want to let my readers down, though. I am, therefore, going to borrow a page from Microsoft and pre-announce a few future posts. I have a couple of longer articles in the works – the first of which should be finished shortly (the article explains why you should use a Mac, a question that I don’t think has received a sufficient answer). I am also working on a review (or two). So, stay tuned! There is a lot more great stuff to come! One of the things that has drawn me to Macintosh computers is that there are so many beautiful applications. Many Mac applications look good simply because the basic window elements in OS X are attractive. There are a few Mac applications, though, that raise the bar. After being particularly impressed with a recent new application, I decided to list my top 10 most beautiful Mac applications. Almost everyone in the civilized world probably recognizes iTunes as Apple’s music, TV, and movie catalog and player. 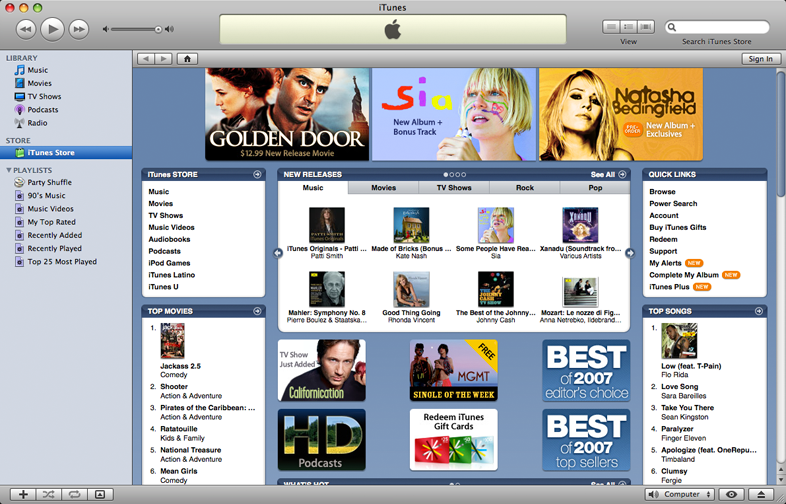 Since the very first release, iTunes has been ahead of the interface curve. Design elements introduced in iTunes have slowly made their way to the rest of OS X. It’s easy to see why. iTunes is functional and very pleasing to the eye. Delicious Library isn’t just beautiful, it’s also very innovative (I am not the only one who thinks so – they have an impressive list of awards at the bottom of their home page). Delicious Library is a book, movie, and video game catalog application. Titles in your library can be displayed in a list or in bookshelf mode. 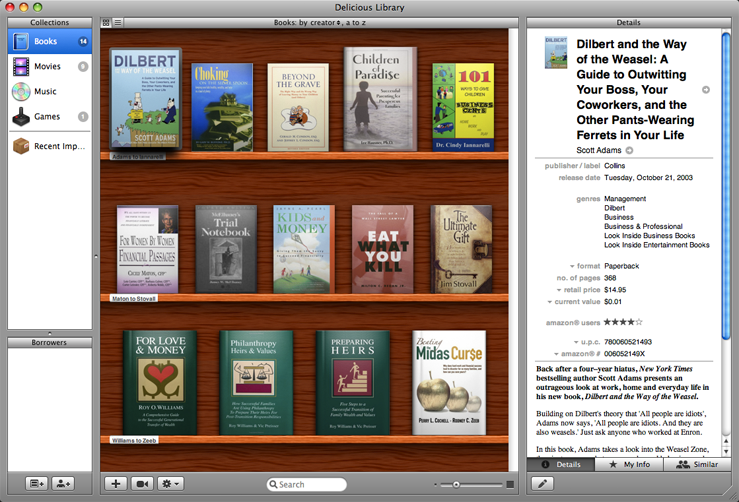 List mode is quite functional, but it is bookshelf mode where Delicious Library really shines. The book, movie, and game covers – downloaded automatically from the internet &dash; and wood bookshelf are very attractive. I just wish there was a choice of wood for the bookshelf. Things was actually one of the applications that prompted me to create this list (even the disk image looked pretty nice). Cultured Code’s other application – Xyle Scope – is also quite comely, but it doesn’t make this list because it is a tool for website designers. 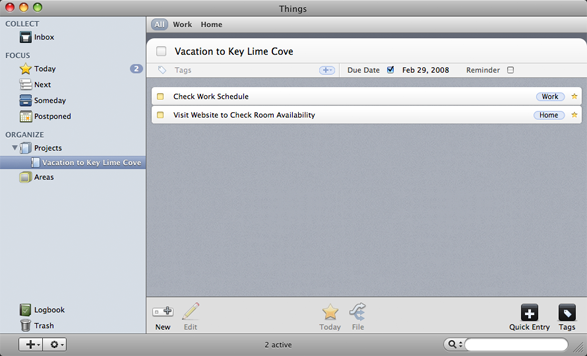 Things is the latest entry into a very crowded space, the GTD / notebook software. It’s an attractive entry too – and, although not reflected in the screenshot here, looks better and better as you enter more data. iStat started small, as a series of Dashboard widgets. Those widgets grew into iStat Pro, a single combo widget, and iStat 2.0, a desktop version. iStat Pro gives me one place to look to see the current status of my computer – RAM and processor usage, free disk space, uptime, and much more. It’s also quite attractive – iStat Pro is minimalist, yet stylish. 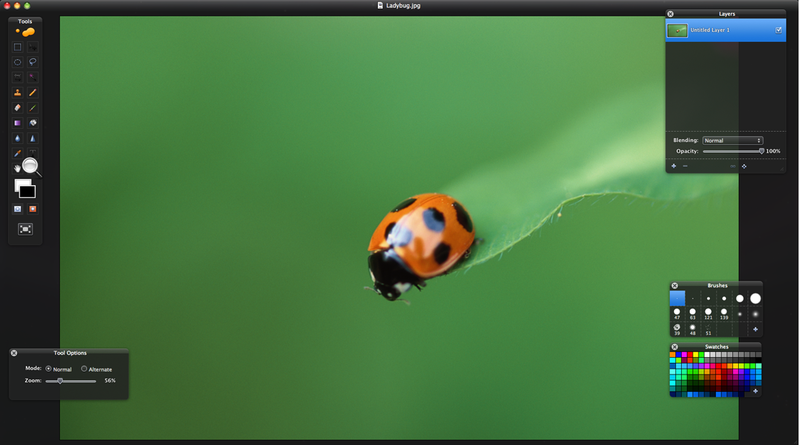 CandyBar is a beautiful application in two ways – it’s quite attractive by itself, but it also allows you to make the rest of your computer more beautiful. 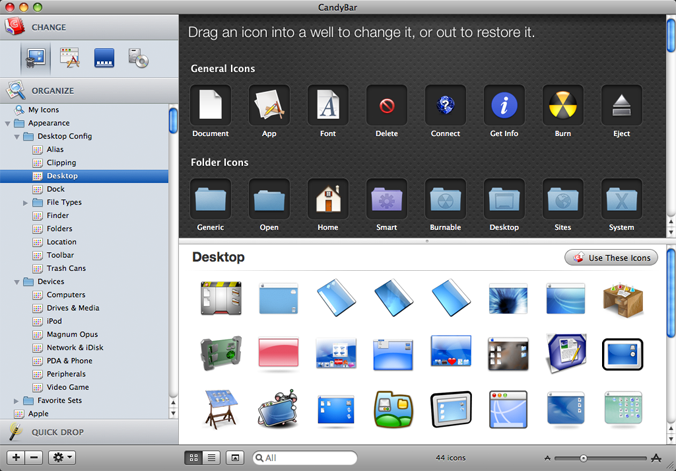 CandyBar allows you to easily change your system icons and modify the appearance of the dock. Until recently, there was a separate application, called Pixadex, for maintaining your library of icons. With version 3 of CandyBar, the Pixadex and CandyBar functionality have been incorporated into one application. OmniWeb is a great-looking application. But I’ll be honest, OmniWeb is only on this list because I thought there should be a browser representative. Of the browsers I have used – Safari, OmniWeb, Shiira, Firefox, Camino, and Opera – OmniWeb is the best looking. Pixelmator is one of several new full-featured image editing programs that take advantage of the Core Image technology built into OS X. Everything in Pixelmator looks like a palette from one of Apple’s Pro applications (think: Final Cut, Motion). That ‘Pro’ theme has worked its way into Mac OS X via the Quickview feature in Leopard. But Pixelmator isn’t all beauty, it has some brains too. Coming in at under $60, Pixelmator is viewed by many as a cost-effective alternative to Adobe Photoshop for people who need to do a little editing, but don’t make their living at it. 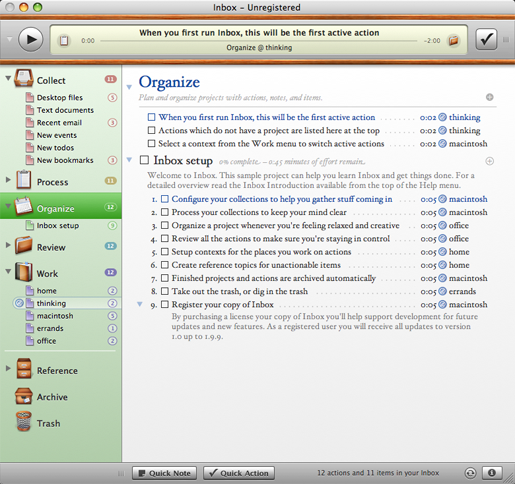 Midnight Inbox is one of many GTD applications for Mac OS X. Unlike many GTD applications, which are essentially enhanced TO-DO lists, Inbox seems to be designed from beginning to implement the Getting Things Done workflow that David Allen describes in his book. While Inbox may be practical and useful, the reason it’s on this list is because it’s stunning to look at. If someone had told me that they planned to use lots of wood trim in the design of their Mac application, I would have laughed. Inbox has made me a believer. p.s. Yes, I haven’t bought Inbox yet. It’s possible that using Inbox would make my life 10 times easier and make me 10 times more effective. I just don’t have the time to devote to learning a whole new way of doing things. That, at least, is the benefit of an “enhanced TO-DO list” – you can improve your processes, you don’t have to learn entirely new ones. 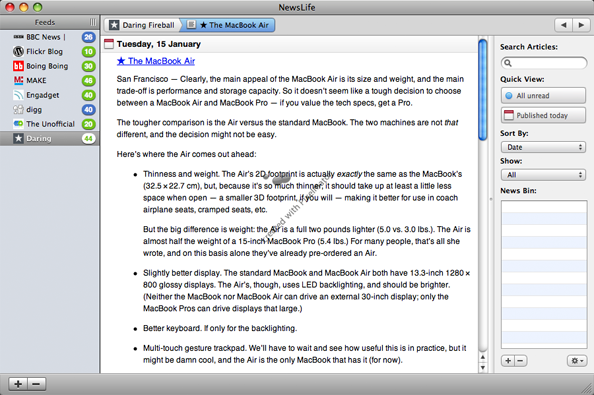 NewsLife debuted last summer in an attempt to dethrone NetNewsWire, the reining RSS champion for Mac OS X. Recently, Ranchero upped the ante by reducing the price for NetNewsWire to $0. NetNewsWire is the price king, and possibly the feature king (it certainly is in the minds of some), but Newslife is still better looking. Adobe Photoshop Lightroom is primarily for photographers (amateur or professional). I have to concede that photography falls a little outside the declared boundaries for the list (no design geek software!). 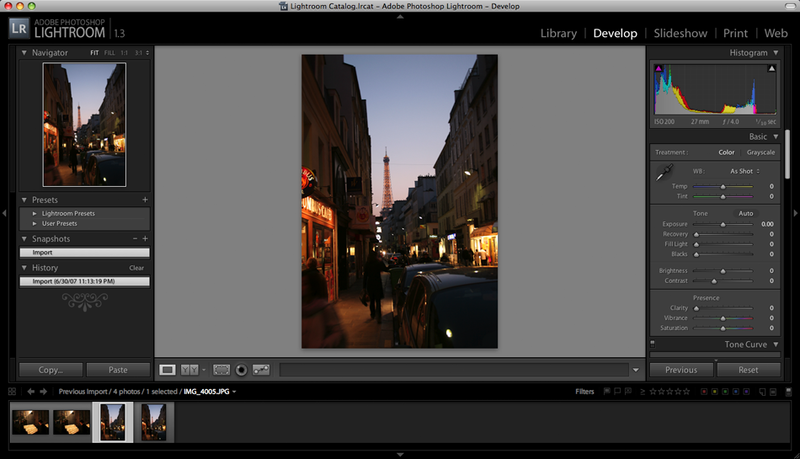 Lightroom is just too good to leave off, though. It exemplifies all that is good and pure about the Apple ‘Pro’ style. You might be looking at some of my choices and thinking, “it’s a nice piece of software, but it’s not exactly beautiful.” So what criteria did I use in choosing these 10? I am glad you asked. Overall appearance was, understandably, the largest factor. Looks alone weren’t enough, though. I also factored in usability and genre. The type of software is relevant because some kinds of applications are more difficult to make beautiful than others. Finally, I also restricted each software publisher to one entry in the top 10. The publishers who lost out on account of this rule were Panic, The Omni Group, and Cultured Code (Cultured Code also lost out due to the non-geek requirement). Steve Jobs introduced Time Capsule in the keynote speech on Tuesday. Time Capsule is Apple’s new wireless network storage device that is intended to be used with Time Machine. One thing troubles me, though. Before Leopard was released, the developer versions of Leopard allowed Time Machine to be used with USB hard drives connected to an Airport Extreme. That functionality is not present in the release version of Leopard. At first, many people thought there must be a technical reason – perhaps it required more testing. Now, it seems, that the motivation was purely financial – encouraging people to buy Time Capsule. I bought an Airport Extreme in anticipation of being able to use it to backup the computers in my house. Now it looks like I might have to use something other than Time Machine. Perhaps I’ll buy Chronosync licenses for the rest of my computers. 2. There be Dragon(s) Here! One of the big names in speech recognition is Dragon Naturally Speaking. Many lawyers use Dragon while drafting letters, pleadings, motions, and other documents. Unfortunately, Dragon hasn’t been available on the Mac … until now. 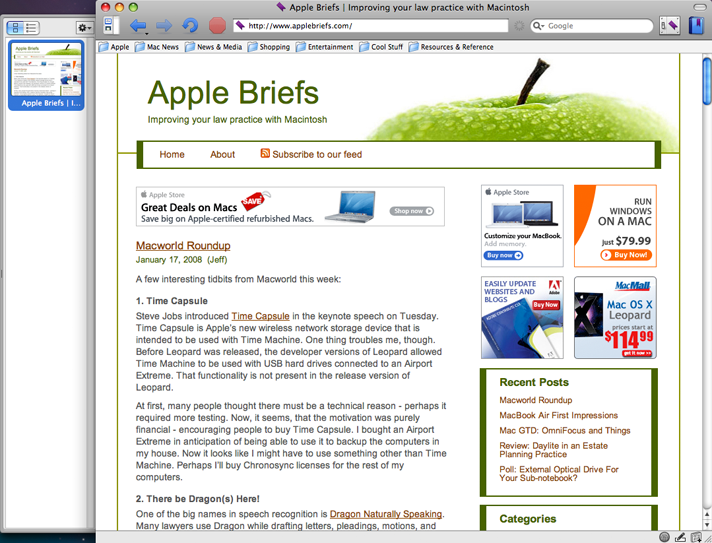 MacSpeech, makers of iListen, announced a new product at Macworld – MacSpeech Dictate. MacSpeech iListen has received good reviews, but many have reported it being a little slow at times. For Dictate, MacSpeech licensed the Dragon speech recognition engine from Nuance. Simply put, Dragon is fast. If you have been interested in dictation software but have been disappointed with the options available on the Mac, you may want to take a look at MacSpeech Dictate. You probably won’t be alone, either – Dictate won a Best of Show award at Macworld. Tuesday at Macworld, Ntractive announced Elements SBM, their entry into the CRM software market (SBM stands for Small Business Management). Elements is a Web 2.0 application, meaning it utilizes advanced web application technologies. Because of this, Elements’ strength seems to lie in the ability to access your data from anywhere. Still, from the information available on the Ntractive website, it appears that some desktop integration is present. Ntractive is currently accepting sign-ups for their public beta. There is no word on when the beta is likely to begin, though. I am not sure that the Web 2.0 thing fits our needs, but I will still be signing up to take a look. At Macworld, Fujitsu announced the ScanSnap S300M, a portable version of its popular ScanSnap scanners. The two main things you need to know about it are: 1) it runs off USB power; and 2) it doesn’t come with the full version of Adobe Acrobat. The ScanSnap S300M is expected to ship in March. Edit: How could I forget the ScanSnap? As rumored, the MacBook Air has an optional external optical drive. What surprised me was the price – $99 – which is very competitive with everything else on the market. The Big surprise regarding the optical drive was Remote Disk, which allows the MacBook Air to share the optical drive of another Mac or PC on the same network. I think we should expect to see few sales of the external optical drive because the MacBook Air seems like a much better second computer than a primary personal computer. The multi-touch trackpad was a nice feature. Rumors had suggested some kind of multi-touch capability on a new Apple product, but people weren’t sure whether the rumors were linked to the sub-notebook or some other product being developed. I don’t see much need for the extra multi-touch features. I already use two-finger scrolling on my MacBook Pro. Rotating and zooming makes sense on an iPhone, but how often do people need to do that on their computer? The MacBook Air ships with 2GB of RAM and isn’t upgradable. It’s nice to see Apple ship a laptop with a reasonable amount of RAM, but design considerations probably drove the decision more than generosity (if you can call “not price gouging” on RAM upgrades generous). According to Steve, the MacBook Air gets 5 hours of battery life. If this is true and unaffected by the Steve Jobs Reality Distortion Field (see, e.g., Wikipedia), I’ll be pretty excited. I regularly got 2+ hours out of my 12″ PowerMac with the wireless on. Getting 5 hours of wireless use without adding ugly external batteries (I am looking at You, Michael Dell) is quite an accomplishment. There was some concern over the fact that the battery was not user-replaceable. However, many sites are now reporting that Apple will replace the battery for $129 (parts & labor included in the price). That’s a tidy sum, but paying $129 every 1-2 years to keep your laptop going is a small price to pay for the size and convenience of the MacBook Air. Finally, we come to the price. I was hoping the MacBook Air would come in a little cheaper (in the $1600-1700 range). Having watched the keynote, though, I can understand the price point. A lot of engineering went into the MacBook Air, and, judging from the reaction of the crowd, I think Apple will have no trouble selling many, many MacBook Airs at $1799. 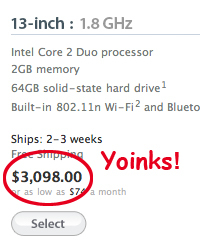 The big shock came from seeing the price of the 1.8GHz model with the SSD drive. One of the benefits of SSD drives is their superior reliability. If that’s the only benefit, I don’t think many people will find the price justifiable. I look forward to seeing battery life and performance tests for the new drives. Hopefully Bare Feats will get their hands on one soon. I am confused about Apple’s choice to list two models. Both the 1.8GHz processor and the SSD drive are upgrades on the base MacBook Air. They could just as easily have had a single model and make everything an upgrade of that model, like they did with the Mac Pro. I look forward to the day I can visit our local Apple Store and see the MacBook Air in person. If they’re shipping in two weeks, that day can’t be too far off …. can it? The past few days saw two big announcements related to Macintosh GTD software. Yesterday, The Omni Group announced the release of version 1.0 of OmniFocus. I have been using OmniFocus since the private beta, and really enjoy using it. We also saw the public release of Things, a new GTD app from the makers of Xyle Scope. Xyle Scope is an excellent application that I have used for quite some time (but I expect that most of my readers haven’t – it’s primarily useful for web developers). Things looks quite good, and I look forward to trying it out. The name “Things” does make for some interesting grammar, doesn’t it? Some of the similarities and differences between OmniFocus and Things are readily apparent from the Things video demo. I am really curious how Things’ emphasis on tags plays out in every day use. I am going to reserve a full review and comparison with OmniFocus until Things gets closer to a 1.0 release.